The Angriest: Izetta: The Last Witch: "The Battle of Sognefjord"
Izetta: The Last Witch: "The Battle of Sognefjord"
It is 12 November 2016, and time for another episode of Izetta: The Last Witch. To demonstrate Izetta's power to the allied nations, Finé pledges to destroy the Drachenfels - a newly built and immensely powerful Germanian aircraft carrier. On the ship itself, however, an ace Germanian captain prepares to defend the Drachenfels from the air, and Berkmann waits in the shadows to learn more of Izetta's powers. We're up to episode 7 of Izetta: The Last Witch, and that is definitely long enough to get a firm understanding of the series' plot, tone and style. It is pretty clear at this stage that it's a series of two halves, one of which works exceptionally well and the other of which grates terribly on the nerves. What's a viewer to do? To kick off with the irritating part: once again an episode feels tarnished by the shoe-horned-in fan service. 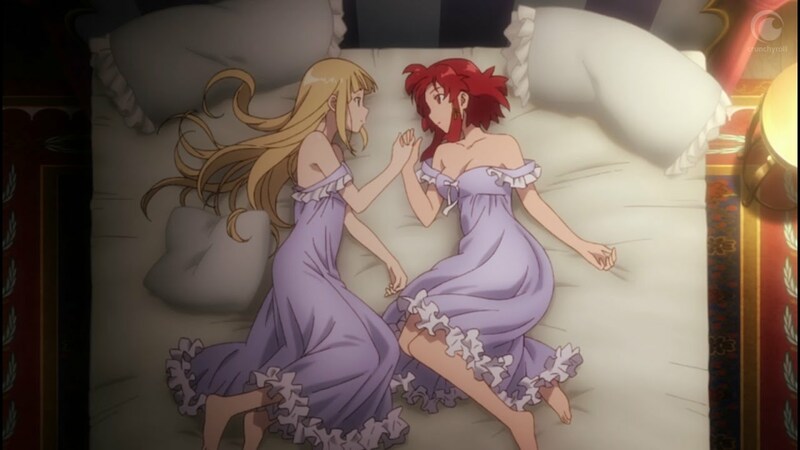 In this case Finé and Izetta lie together on a bed with cleavage wildly on display, before they start wrestling and tickling each other in what can only be described as 'egregious faux lesbianism'. If the series actually made the characters lesbians that would be one thing, but its purpose is purely to tease and arouse a teenage (or teenage-at-heart) male audience. It distracts from the plot, and once again does not actually fit well with the rest of the action. In this episode's case, the rest of the action is an outstanding aerial combat sequence, in which Izetta controls four torpedoes with her magic and makes a risky dive-bombing run on the Drachenfels. An entire squadron of fighters take off to challenge her, including the driven and relentless ace captain. The sequence is well paced and staged, and fills out the bulk of the episode's second half. This is what Izetta: The Last Witch does best: transform World War II action scenes with the addition of a broomstick-flying witch. The animation is effective and dynamic, with a good blending of traditional and CGI elements. The episode also benefits from expanding the scope of the conflict from Eylstadt defending itself from Germania to the much broader European conflict. It widens the horizon of the series in a solid fashion, and at an appropriate point in the series as well. This is the halfway mark, and it felt like time to up the ante a little bit. Enjoying Izetta means either liking the fan service, or gritting one's teeth to get through maybe one key scene per episode before returning to the smarter, better presented World War II fantasy. I am clearly choosing the latter, but for some viewers even a bit of the crude sexuality is enough to send them looking for better entertainment elsewhere. I don't blame them; I am sticking with Izetta, but it is a troublesome, imperfect series. I enjoyed this episode overall, leaving the series with a quality ratio of 71 per cent - that ratio would drop remarkably fast for anyone avoiding cleavage and fake lesbians.